Impatience Leads To Rage On Sidewalks, Too : Shots - Health News Believe it or not, there are scientists who study sidewalk rage, and one has even come up with a 15-question Pedestrian Aggressiveness Syndrome Scale to quantify some people's problem with slow walkers. Are you brave enough to try it? 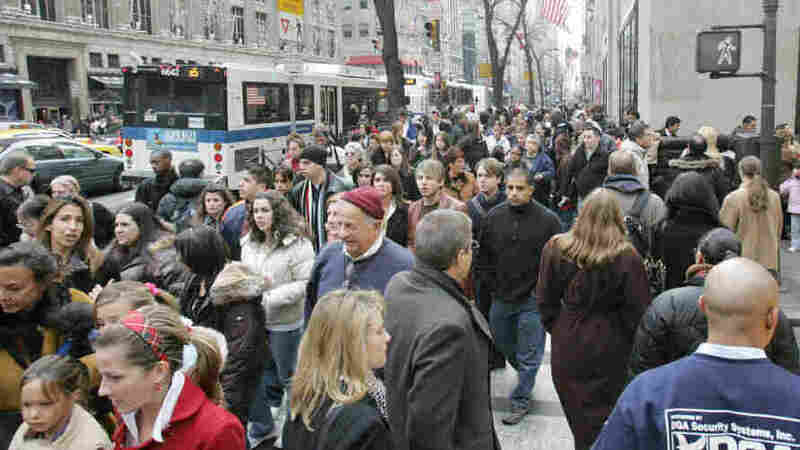 Crowds pack a New York sidewalk days before Christmas in 2006. Since leaving New York a few years ago, I'm a lot calmer when walking down the street. Dawdling tourists with fanny packs used to drive me nuts, especially when I was late (the usual situation) on my way to meetings. Sure, there are plenty of tourists tramping around Washington, too, but the sidewalks are wider and somehow or other the throngs of slowpokes here don't affect me the way they used to. So it was with a twinge of neurotic nostalgia that I read the Wall Street Journal story by Shirley Wang, an old colleague of mine, about people who get infuriated by slow walkers. Transportation rage isn't limited to drivers. Believe it or not, there are scientists who study "sidewalk rage," and one has even come up with a 15-question Pedestrian Aggressiveness Syndrome Scale to quantify the problem. Have denigrating thoughts about other pedestrians. Act in a hostile manner (staring, presenting a mean face, moving faster or closer than expected). Fail to yield to another pedestrian when it's the polite thing to do. Walk by a slower moving pedestrian and cut back too soon. You don't have to tell us how you scored, but Dr. James, a psychologist at the University of Hawaii, Manoa, copped to the Journal about his own issues dealing with the tourists hogging the sidewalk. His wife called him out as an aggressive walker, and he does his best now "to walk around people rather than into them."